A million sales in the first month would be a great start for DJ Hero, but that isn't what publisher Activision is expecting. It's not often that a publisher is willing to admit that their game is not going to be the best-selling thing since gold-plated awesome, so when Red Octane co-founder Kai Huang says that DJ Hero is not going to be topping sales chart, it's refreshingly honest. "We're not expecting a typical videogame curve where you sell the majority of the units in the first month and then it decays quickly," Huang said. "We're expecting this to be the type of game that may come out of the gate a little bit slower, but continue to grow over time." "We've got a bit of a head start, people have an understanding what music games are, it has the 'Hero' brand on it," he said. "But at the same time, people don't know what a DJ game is. They don't know what you're supposed to do. Our strategy again is to focus on in-store demos." I'll be honest, it's only recently that my interest has been piqued by DJ Hero, and that's largely because it features Vanilla Ice vs MC Hammer; but I've never really been a fan of dance music so I'm not sure if I can necessarily trust my opinion on the game. What do you think about it? 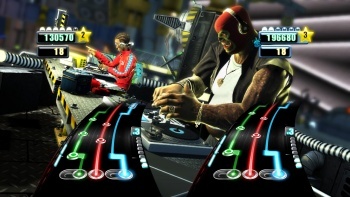 Will DJ Hero be a slow-burning hit, or an embarrassing flop? Or, will it defy expectations and sell like the proverbial hot cakes?